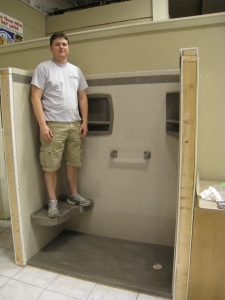 Our goal; to remodel our customers bathroom in order to make it more usable and convenient pursuant to their special needs….. Whether it’s due to an illness, accident or aging in place…we all would prefer to remain in our homes as long as possible. Dalco recognizes and is able to aid in this desire with products and knowledge to remodel the bathroom to provide better function and convenience and in most cases do the project and still keep a home appearance. We offer services from the simple addition of balance assist products to fully redesigned bathrooms with the latest in special needs products. We are able to equip a bath with roll in retro-fit showers, hand held and body spray shower units, roll up to vanities and lavs, extra high toilets with hand assist, paddle lav faucets and dozens of other products to make the bathroom a place of relaxation and convenience, again. With the myriad of new products on the market today, the bathroom can be transformed to assist even the most sever requirements, without surrendering the homes appearance. And with our factory direct purchasing power, the remodel can fit most budgets. Your in home estimate is no charge and we will gladly share our accumulated knowledge and experience with you.